Client: We’ve got 6 weeks until our AGM. Can you do it? 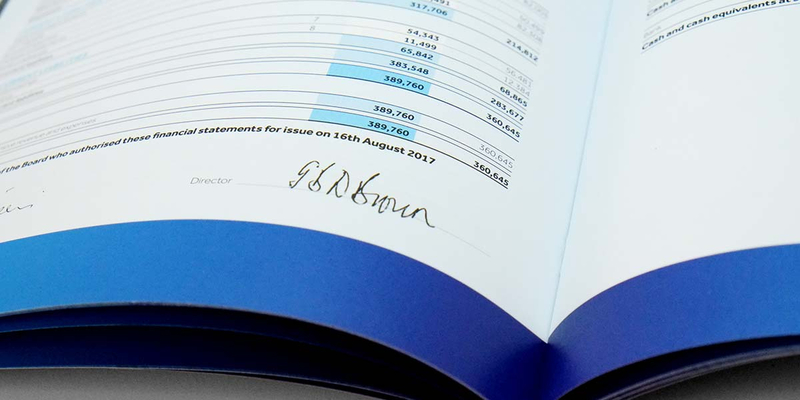 Legally required content means that annual report design is detailed work and deadline driven. 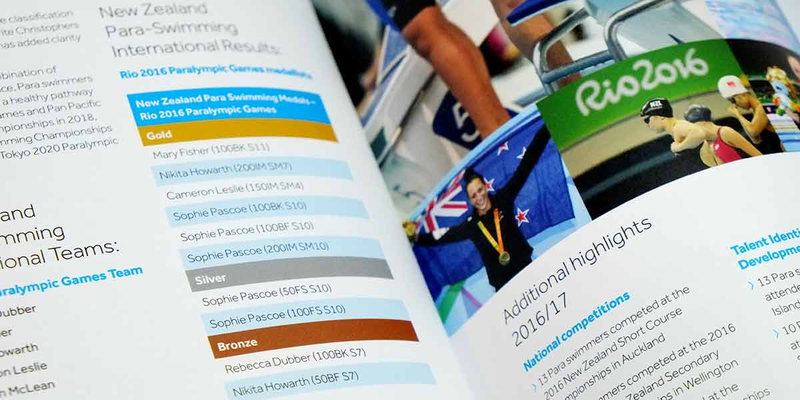 The 2017 annual report for Swimming New Zealand was no exception. We were briefed by new CEO, Steve Johns six weeks before the AGM and were never afraid of the challenge. 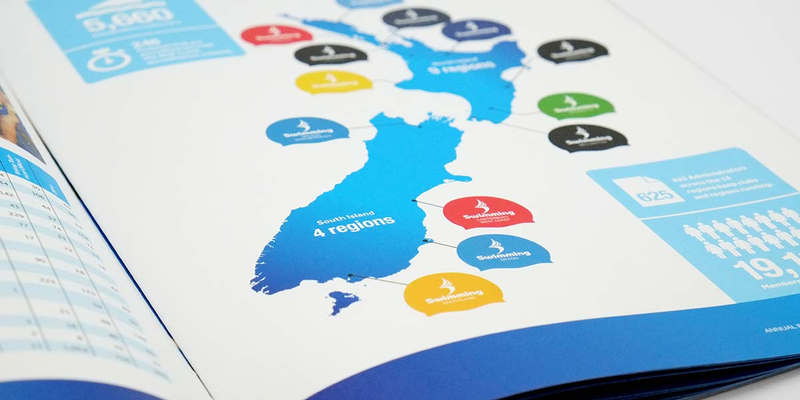 The 2017 annual report design for Swimming New Zealand is the result of Angle’s fourth consecutive year working with this client but our first time working with their new CEO, Steve Johns. With a restricted timeline (the AGM had been brought forward by 4 weeks), we adapted the previous year’s design to create a new look and feel but retained enough of the structure to reduce the time pressure. Far from being a compromise, the 2017 annual report design is inspiring, colourful, positive and well rounded. 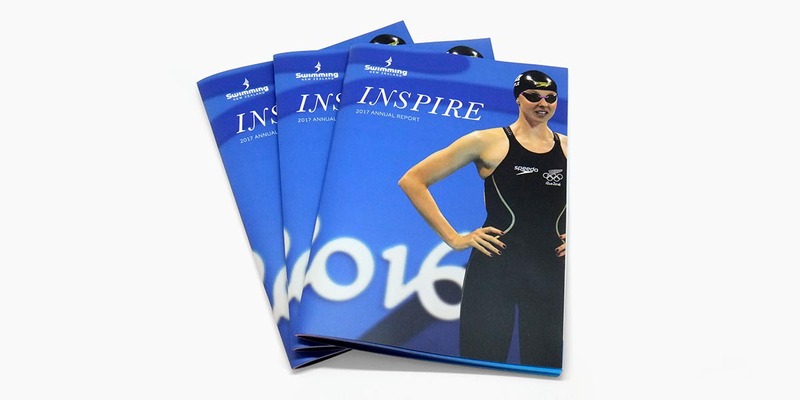 The cover title ‘Inspire’ is the key within Swimming New Zealand’s vision statement. 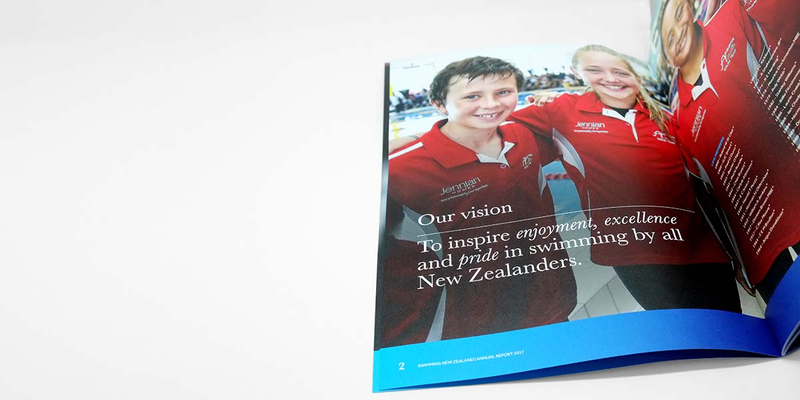 The full vision is: ‘To inspire enjoyment, excellence and pride in swimming by all New Zealanders’. 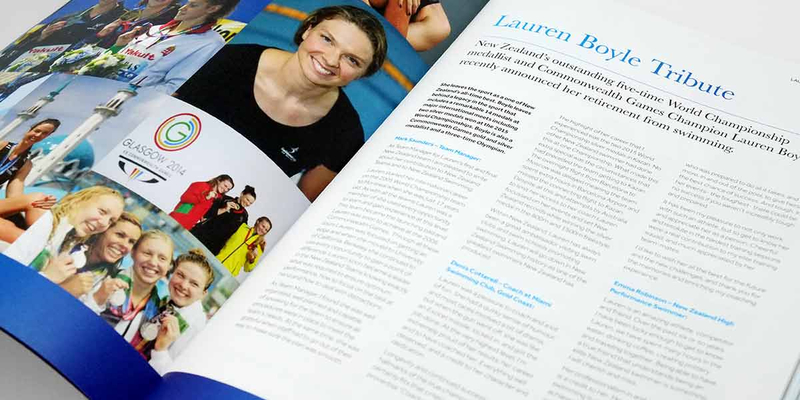 And who better to inspire Kiwis to swim than Lauren Boyle? New Zealand’s premier swimmer announced her retirement from competitive swimming in early August this year, after a hugely successful career. 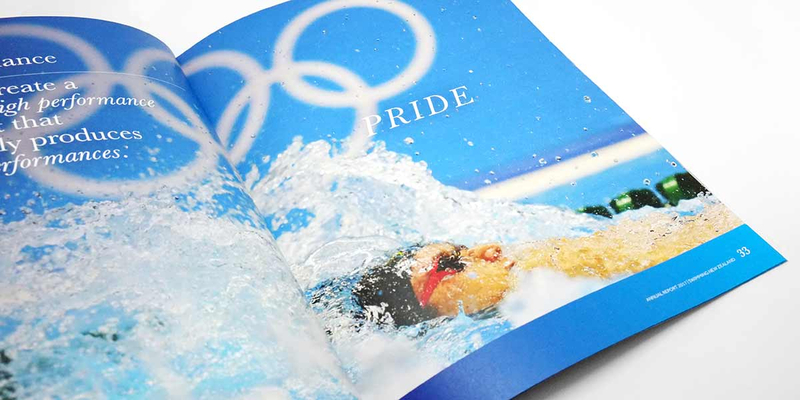 An iconic photo of her at the Rio Olympics in 2016 graces the annual report cover. Great action shots and info-graphics are clearly presented with fresh page layouts featuring rich blue gradients throughout. With this design palette, we delivered a report covering all the year’s activities: education, competitive swimming and high performance. 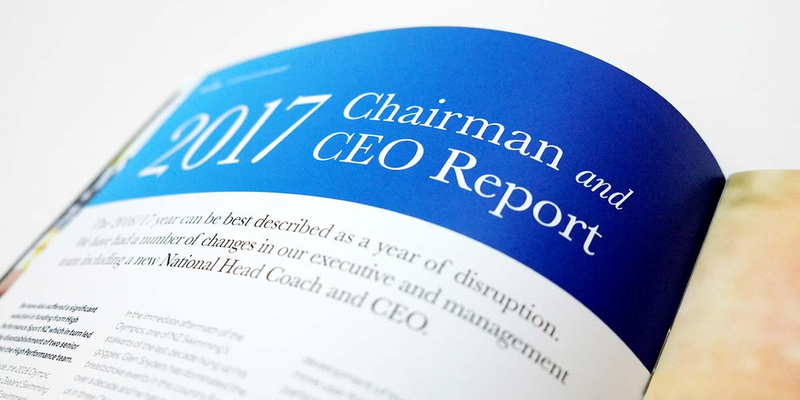 Finished copies were printed and delivered a day in advance of the Annual General Meeting on 2 September 2017. Swimming New Zealand is a national sports organisation. 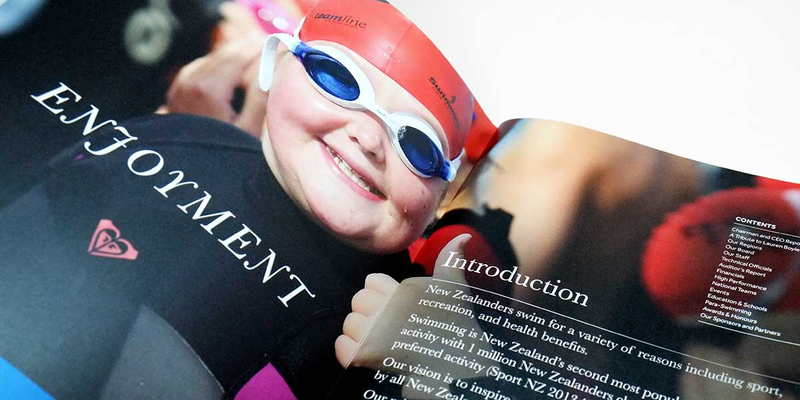 They promote and govern swimming and help to ensure that every New Zealander swims to their potential. 2017 is their 127th AGM. Do you need a graphic design team that creates world class design for print? Our creative team with decades of experience is the solution. We deliver small and large format projects, via short digital print runs or large offset print runs. Find out about our graphic design for print specialist skills.